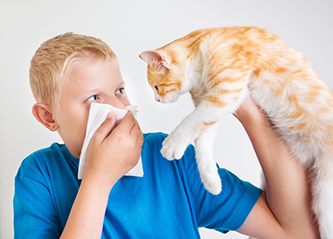 Are pollens, molds, dust, food allergies or pet dander making you miserable? Sometimes, our bodies will mistake a harmless substance as a threat to our immune system. When this happens, an allergy will develop, leading to miserable symptoms such as itchy eyes, stuffy nose or wheezing. Sometimes, even dangerous or life-threatening whole-body reactions can cause difficulty breathing, hives, swelling in the throat, cardiovascular collapse, or even death. Allergy symptoms may affect all parts of the body, including nasal passages, skin, lungs, or the digestive tract. Whether you are affected by seasonal allergies (such as pollen) or perennial (year-round allergies, such as animal dander, dust, or mold), the Ear, Nose, Throat & Allergy care team is ready to develop a personalized treatment plan to provide long-lasting relief. Imagine living your life free of the worry of an allergic reaction! Dr. Brian Hasslinger and his staff of allergy care specialists want you to leave your worries at the door when you arrive at our office. We’re here to make you feel welcome and ensure that you have the best possible experience. The Ear, Nose, Throat & Allergy care team has the ability to test and treat patients from the age of 2 and up utilizing highly-accurate testing options that include skin testing (both prick and intradermal) and blood testing. Once the allergens affecting your immune system have been identified, we’ll begin your personal treatment plan utilizing either allergy shots or allergy drop treatment. Allergy drops (also known as sublingual immunotherapy) are administered via a daily drop under the tongue, rather than an injection. Allergy drop immunotherapy has been used safely for over 100 years in both adult and pediatric patients. Imagine taking control of your allergies, one easy drop at a time. Clinical studies have proven allergy drops to be an effective alternative to allergy shots. Easily administered at home, allergy drops allow patients to avoid taking time off from work or school for regular office visits which are required by shots. No injections also means that patients will experience less pain and discomfort. Allergy drops are endorsed by the World Health Organization (WHO) and the Allergic Rhinitis and its Impact on Asthma (ARIA) guideline. Most patients treated with allergy drops will experience fewer symptoms and begin to build immunity within a few weeks of initial treatment. Others should expect to see gradual results after several months of treatment. Dr. Hasslinger and his team of allergy care specialists will customize a dosing schedule according to your particular allergies. Side effects are generally mild and require no treatment. Patients may experience itching or tingling inside of the mouth or mild swelling beneath the tongue. Uncommon, more adverse reactions may include wheezing, stomach irritation, and nausea in patients who are asthmatic. Don’t Let Allergies Control Your Life! Dr. Brian Hasslinger is committed to quality allergy care.